Get ready for a learning adventure like no other as you explore the historic, educational, and artsy town of Huntsville, Alabama! Home to some of the best learning opportunities in the state, as well as some of the most unique and renown art exhibits, Huntsville is sure to impress every kind education lover in your group. Created with the perfect mix of educational adventure and thought-provoking vacation spots, this trip will offer you and your students the opportunity to see the place where the space race began, the leading facility in biotechnology, one of the most efficient farms in Alabama, plus national leaders in art and entertainment education. Prepare for two days of exciting learning opportunities as your group takes in the sights and sounds of northern Alabama! U.S. Space and Rocket Center - Start your educational vacation the right way at the birthplace of the American Space Program, the U.S. Space and Rocket Center. Known as the most comprehensive U.S. manned spaceflight hardware museum in the world, this learning facility is the location of development of rockets that first put the United States satellite into orbit, and also developed power for the first shuttle. Inside the center, you can see firsthand their Rocket Park which houses 27 missiles and rockets. Since its opening in 1970, this center has seen over 16 million visitors who flocked here for the opportunity to ‘be an astronaut for a day.’ Multiple simulators, exhibits, artifacts, and films from the IMAX and National Geographic theater all work together to teach your group everything they need to know about our first mission to space, the innovations we have seen since then, as well as future plans for bigger and better space technology and missions. Be sure to check out the Saturn V Moon Rocket and Apollo 12 moon rock before you leave! Hudson Alpha Institute for Biotechnology - The worlds 4th largest biotechnology research campus awaits your group at the Hudson Alpha Institute for Biotechnology. Inside this facility, the world’s leaders in genomics, innovative entrepreneurs, and edgy educators all come together to provide a research space for genomics that strives for real-world benefits. With a focus on improving human health and the quality of life, this 152-acre Biotech Campus in Cummings Research Park allows guests to tour the facility or sit in on classes in the 270,000 square foot facility. Your group will also get the chance to see the genome sequencing center, incubation labs, freezer farms, tissue culture stations, and microbiology labs. The institute itself is an architectural wonder, so sit down and take it all in at the Atrium Cafe in the center of the facility and have a bite to eat with the scientists behind it all. You may even run into the president of the facility who is personally responsible for mapping out 11% of the human genome sequence himself! J Sparks Hydroponic Farm - End your group's day of learning at J Sparks Hydroponic Farm, the most earth-friendly farm in all of Alabama. This highly efficient and constantly productive farming facility strives to protect the earth while supporting the growing population, which it has proven to do very well so far. Growing a large variety of vegetables, from arugula to zucchini, the farm is most widely known for their crispy leaf lettuce as well as the best tomatoes in Alabama. They also grow wildflowers and fruits such as blueberries and watermelon. A visit to the hydroponic farm will allow your group to tour the grounds and see what it takes to make a successful hydroponic system, learn how that system works, and also buy any fresh produce they would like. The J Sparks farm sits on a mere 1.5 acres but supports 38,000 plants, a feat which would take 20 acres on traditional dirt. They also only use 2,200 gallons of water versus a whopping 50,000 that would be needed on land! Lowe Mill Arts and Entertainment - Rise and shine and get ready for an adventure in America’s largest independent center for arts. Lowe Mill Arts and Entertainment center features 120 working artists, a series of businesses, restaurants, and live art performances that all work together to teach the public about music, art, and culture. Housed in a huge historic textile mill, the Lowe Mill center focuses on a wide range of art education including culinary arts, film, literary arts, performing, and visual arts. There’s something for everyone in your group at this stop with daily activities involving a random array of educational classes such as yoga, comic book illustration, makeup arts, watercolors, swing dancing lessons, and pottery. Guests are encouraged to enter various studios and speak with the artists to learn about their process, inspirations, or even purchase some of their work! 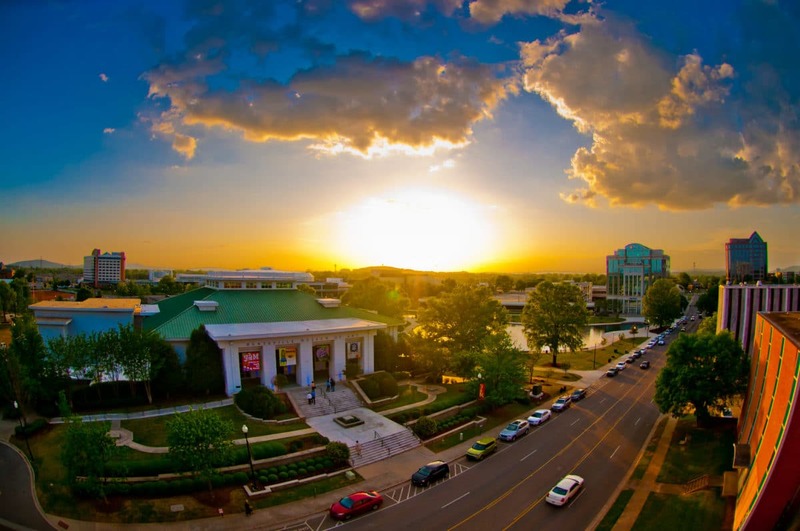 Huntsville Museum of Art - Your next stop will bring you to North Alabama’s leading visual arts center, located in Big Spring International Park. This museum will astound your group with 13 galleries full of amazing regional, national, and worldwide pieces of art. Considered to be a top 10 destination for travel in Alabama, the Huntsville Museum of Art is gaining more momentum every day as a leader in world art, attracting over 40,000 visitors last year to its Russian Imperial art display. With a goal of fostering understanding of visual arts and garnering appreciation for this achievement, the museum will allow your group to get involved in art classes, daily programs, various lectures, and live musical presentations. Spaces Sculpture Trail - This next stop is actually a series of stops, totaling at 9 various locations throughout Huntsville and Madison County. Spaces Sculpture Trail is one of the largest revolving sculpture shows in the nation, featuring 37 sculptures throughout the area. This large-scale outdoor art exhibit features 25 different sculptors from around the United States and is meant to ‘give people a reason to pause for a moment.’ Your group will find it hard to pause for just one moment as they marvel at the diverse group of sculptures, with styles ranging from abstract, realistic, serious, and whimsical. Personal tours are encouraged with an online GPS guiding system giving you information about each piece. Snap a picture with the 10-foot tall Tower of Babel near the Lowe Mill Center or take advantage of the convenient downtown locations and grab a bite to eat in any of the many local eateries surrounding the trail! Maria Howard Weeden Home - The last stop of your day will bring you to the beautiful and historical home of Maria Howard Weeden. This gorgeous estate will teach your group the wonders of the 19th century, show them fantastic examples of early American architecture, fill them in on regional history, and educate their ecological and literary sides. A sort of all-in-one unique learning experience is created in this home as you can tour the "seeker of beauty’s" family home, including the famous rose garden and other more primal flower species. Maria Weeden was known for capturing and recording the essence of beauty from the garden and individuals around her in paintings and poems published in her four books. Built in 1819 and kept well preserved, the house itself will shed light on the Civil War-era type of living and how it affected Maria Weeden and her family during the time.